Solidarity and responsibility-sharing in this sensitive policy area are likely to draw increasingly on a more fragmented, unpredictable and bottom up set of principles and modus operandi. 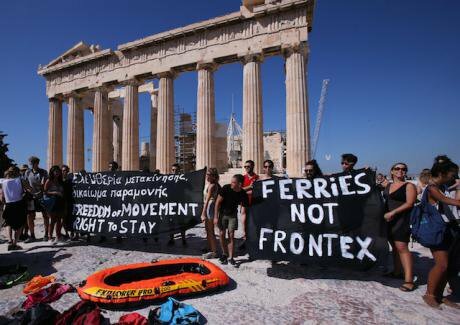 Activists hold banners protesting the refugee-migration crisis in front of the Parthenon temple on the Acropolis hill in Athens, Greece, on Sept. 5, 2017. Marios Lolos/ Press Association. All rights reserved.The EU Relocation programme, which aimed to relocate 160,000 people in need of international protection from Greece and Italy to the other member states over a two-year period, came to an end on 26 September. After two of years of tortuous implementation, less than 28,000 eligible people, or 17.5 per cent of the total planned target, were relocated under the programme. While Hungary and Poland, the most outspoken opponents to the compulsory migrant quota scheme, have failed to relocate a single migrant over the two-year implementation period, more than 20 member states have actually under-performed on their legally binding commitments by at least 50 percent. Considering that the migrant relocation programme has clearly shown that compulsory solidarity in such a sensitive area as migration policy is a notion that might never be endorsed, at least in practice, by most member states, the question must now be asked whether efforts should still be pursued to renew the existing scheme in one form or another. And if this is not to be the case, whether the absence of a compulsory solidary regime will be likely to make any difference to the EU’s current immigration policy environment. On the first question, few qualified observers today would dispute the fact that any prolongation of the existing compulsory quota system against the will of most member states would have little chance of producing a more encouraging outcome than that recorded over the past two years. On the question of whether the absence of any such scheme could truly impact the current EU immigration policy regime, there can be little doubt that the lack of an organised system of re-distribution of crisis-induced migrant arrivals among all member states would seriously undermine the already sub-optimal reception capacity and conditions in a handful of member states, most notably Greece and Italy, which have had to carry most of the burden on behalf of the EU since the outbreak of the so-called migrant/refugee crisis in 2015. While flows to Italy have decreased considerably since the beginning of the year due to the launch of a range of cooperation measures with Libya and other countries of origin and transit, they have started to increase again in Greece, despite the existence of the EU-Turkey agreement on migration, whose efficiency has tended to oscillate according to the state of relations and tension between the EU and Turkish authorities. While it is now the European Commission’s intention to keep on supporting financially those member states that are willing to continue relocating eligible migrants outside of any formal EU scheme, what other options should be put on the table to accommodate both the need for a functioning responsibility-sharing environment and the member states‘ reluctance to enter a new compulsory solidarity regime in the field of migration and refugee affairs? The first option, that would no doubt be acclaimed by most member states, would consist of establishing unambiguously a “free and open market of solidarity”, whereby each member of the bloc would be left to decide on the level and nature of its inputs into the EU’s migrant solidarity regime. This would not only consist of relocating eligible migrants but could also include other forms of support such as financial and technical contributions to the various EU programmes on the surveillance of the external borders of the Union. However appealing it may seem in the current period of profound intra-EU tension in this and other policy areas, one of the problems with this option is that converting the mandatory nature of the current relocation system into a voluntary one would be unlikely to make a dent in the level of pledges experienced to date. This would imply that ‘solidarity’ and ‘responsibility sharing’ are innate concepts, rather than imposed ones, in the national refugee policies of the member states, when they are clearly not in most cases. The end result of this option would therefore strongly resemble that experienced under the foregoing “regulated’ solidarity regime, with some member states continuing to fare better than others. This is in addition to the fact that, according to the decision by the European Court of Justice on 6 September 2017 to overrule Hungary’s and Slovakia’s objections to the compulsory EU migrant relocation scheme, any contributions to the surveillance of the EU’s external borders, which would aim to prevent future irregular migration flows, can in no way replace a relocation mechanism that is intended to respond to migrant flows that have already occurred and that are already affecting a number of member states. Therefore, any contribution to the EU’s immigration control systems and operations should be considered as complementary to, rather than able to substitute for the member states’ legally binding obligations under the EU Relocation scheme. The second option would consist of encouraging more vigorously direct resettlement from the countries of origin or transit, thereby reducing somewhat the pressure on those member states, most notably Greece and Italy, which host some of the EU’s external borders. Such an initiative might also entail revisiting the resettlement scheme in its current form by expanding its geographic scope to reach not just regional but global levels. The idea would be to make use of all current and future EU cooperation and partnership agreements with third countries as incentives to participate in the resettlement scheme. This would include not only traditional non-EU host countries, which to date have resettled relatively limited numbers of Syrians and Iraqis, but also major countries to the south of Europe, particularly in the Gulf region. The third option would relate to the long-stated objective of facilitating new channels for legal migration to Europe, including through innovative private sponsorship schemes such as that implemented by Canada. Since 1979, Canada has been implementing a ‘Private Sponsorship of Refugees (PSR)’ programme that enables Canadian citizens and permanent residents to provide opportunities for refugees living abroad to find protection and build a new life in Canada. Based on a formal agreement with the Canadian authorities, private sponsors undertake to provide the refugees with care, lodging, settlement assistance and support for the duration of the sponsorship period. One of the problems with EU resettlement and relocation policies implemented to date is that their decision-making and implementation processes have invariably rested with central government authorities alone. At a time of national budget cuts and deficits, and mounting hostility to the migrant crisis among specific segments of European society, it is time for the EU to widen the scope of its resettlement and relocation policies in order to take account of the willingness of selected non-state actors to contribute substantively to the funding and implementation of such policies. In this respect, it is worth recording that the European Commission will be launching next month a major study to explore the possible benefits and challenges of designing such a scheme in Europe. The last option would consist of making optimal use of the forthcoming overhaul of the Dublin System, which provides for the return of applicants to the member states through which they first entered the EU and which has clearly placed an inordinate level of responsibility for the vast majority of asylum seekers on a limited number of member states that happen to host the EU’s external borders. The future Dublin IV Regulation will aim to ensure a fairer sharing of responsibility between member states by complementing the current system with a corrective allocation mechanism in cases of disproportionate pressure. In particular, the new system will automatically establish when a country is handling a disproportionate number of asylum applications, relative to its size and wealth. If one country receives disproportionate numbers above and beyond that reference point, then all new applicants in that country would be relocated, after an admissibility verification of their application, across the EU until the number of applications is back below that level. A member state would also have the option of making a solidarity contribution of €250,000 for each applicant for whom it would have been responsible under the fairness mechanism, to the member state that is reallocated the person instead. Whatever options are retained in the coming weeks and months, what the above overview suggests is that EU solidarity policy in the field of migration and refugee affairs is undergoing a profound state of reconstruction. Solidarity and responsibility-sharing in this sensitive policy area are likely to draw increasingly on a more fragmented, unpredictable and bottom up set of principles and modus operandi, based on voluntary initiatives by member states, as well as by local authorities, the private sector and civil society, who are likely to play a growing role in supporting selected relocation and resettlement measures.